These are the lessons I learned when I made every mistake trying to find paying clients. While it's filled with practical steps you can start applying today. What went into writing this book was tremendous frustration, anxiety and stress trying to get someone to pay me for my services. Before hiring David and his team, I couldn’t get my prospect’s attention. Since we’ve started working together our business has exploded with new leads and opportunities. I am so glad I started working with David. I was pretty unfocused and insecure about how I was going to make my business work. I didn't know what direction to take. David's guidance was exactly what I needed to really focus in, and do the right work to get where I want to go. I know I am on my way to have a record year and I wouldn't be here without all the work I put in thanks to David's coaching. This is by far the best investment I have made in myself and my business. Thanks for everything! Since working with David, I went from struggling-to-get-clients, to earning over 3 times the industry average and ranking in the top of a network of over 400 personal trainers. 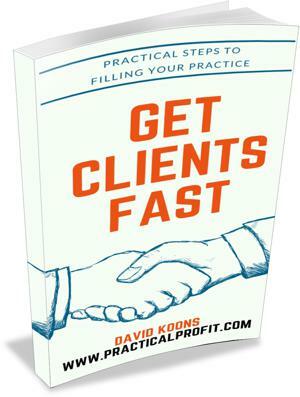 When I contacted David, I was unclear of the true value I bring to my clients. He helped me get very clear and focused on the value I deliver…and who best benefits. By being clear about my value, who can best benefit, and how to structure my services, I was able to enroll a paying client within weeks, and am very excited for the next. Thanks so much!